Several comfort features that make this a top rated boot are the A moisture wicking lining, side drainage vents, and Aegis Microbe Shield ensure your feet are kept cool even in the most extreme environments where top performance is key. 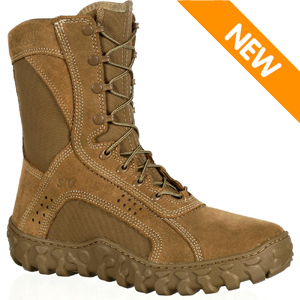 This boot features a boot upper constructed of PTFE (Polytetrafluoroethylene) Flame Retardant Fabric required for operations in military combat vehicles. This version, the Rocky S2V RKC050 Men's Coyote Brown OCP ACU Military Boot, features an instep panel that uses nylon Cordura. A knobby rubber sole made by Vibram ensures max traction in both uneven terrain and urban environments. Built to be a top-performer that will help you get out of sticky situations, the S2V is the choice for die-hard military professionals. Rocky S2V boots run the same size as your athletic or running shoe size.